Here's an easy way to contribute to Japan's recovery. I'm calling on all wine lovers to have sake, instead of wine, for one night next week. Friday, March 25 can be "Drink Sake Tonight." How will this help? 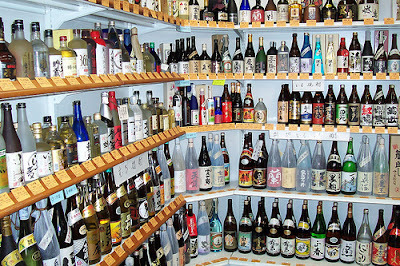 Japan's sake industry is one of the nation's most traditional, representative businesses. Many small sake producers barely eke out a living as it is. With Japan facing reconstruction, premium sake will be a luxury that domestic buyers might forego. Buying Japanese sake will keep producers and exporters employed. Even one night of American wine lovers drinking sake for a change will help rescue at least one Japanese industry from this staggering blow. I mentioned this plan to someone I know at JETRO, the Japanese export agency, and she said: "I heard many famous sake breweries have been broken in the earthquake and gone with the tsunami. Also, surviving breweries have been damaged. So, if you write about Sake, it helps and cheers up them (including me)." I already try to drink more than my share of sake, but I'm just a little guy in my corner of the Internet. So I'm calling on all my fellow wine and food writers to publicize Drink Sake Tonight on Friday, March 25. If any restaurateurs want to hold casual benefit dinners, with proceeds to the Japanese Red Cross, I will maintain a list of those on my own blog, and I encourage all wine and food writers to post lists of such benefits for their own local communities. It's not much, I grant you, but who among us has helicopters or freshwater processors? Drinking Japanese sake is something we can do, and I desperately want to do something. Drink Sake Tonight on Friday, March 25. Tell your friends. I'm on board. Even if just for the moral support, I know that the gesture will be greatly appreciated. Spoke to a friend who I've practiced Aikido with for many years, and shared many tokkuri. His family is west of Sendai, and have reported they are OK...trying to take care of one another, the community, and move forward. Thanks, Todd. I wrote a long emotional post a couple days ago -- I spent nearly 8 years in Japan, and feel a deep connection -- and then decided to shelve it and instead make this gesture, even if it's a tiny one. I can't do much, but I can do this. I am leading a Sake & Italian dinner next Friday, so will be sharing sake with about 20 other people. I will be repeating the dinner on the subsequent Tuesday as well. Plus, Wine Blogging Wednesday #72, which will be officially announced on Monday, will also, in part, be asking bloggers to drink and review a sake. They will also be asked to place a donation badge on their posts, so readers can donate to help Japan. Damn, I blew it, and did it tonight instead. Please forgive me oh mighty W. WBG...I understand how you feel. My wife's dad has lived in Chile since just after Pinochet, and although I myself have only been able to visit a few times, last year after the earthquake there, the urge to reach out and do something was strong. As much wine as was spilled, they were very fortunate in comparison to what is happening in Miyagi now. My local shop is only featuring domestic sake right now, so I need to get around and do some shopping, as I do not think an order to the distributor will arrive in time. Premature sake, King! You'll just have to rest up and go for it again. It encourages people in Japan and I was moved to tears." So can you give the absolute sake novice some suggestions on which Japanese sake to pick up to try? Something accessible but interesting? 15$-25$ a bottle? Sounds great, thanks Blake! Looking forward to next week's post. I was going to ask the same thing Anonymous. I've never had sake before so I figure this would be a great time to try it. I look forward to that post W.B..